Those mourning the loss of The Stieg may find some consolation in a series of adjacently-shelved Scandie crime novels by the ‘other Larsson’. Swedish (presumably ex-) tax lawyer Asa Larsson was brought up in Kiruna in the far (far) north of the country, deep inside the Arctic Circle, where a favourite pastime of the locals is hunkering down with their tinnies and wood-burners in a teensy ‘ark’ on an icy lake and dangling a fishing line through a hole in the ice. When one such local staggers outside for a piss, his ark is uprooted like a wooden tooth by an Arctic gale, forcing him to break in to a nearby ark where he discovers the elegantly-coiffured corpse of a woman, deep-frozen and wrapped in a duvet. Thus are we introduced to one of the main characters in this elegantly written and absorbing novel: the weather. It really is very cold in Kiruna, and nearby lakeside Kurravaara where much of the action takes place. Other starring roles are taken by Rebecka (Martinsson, whiz tax lawyer – geddit? 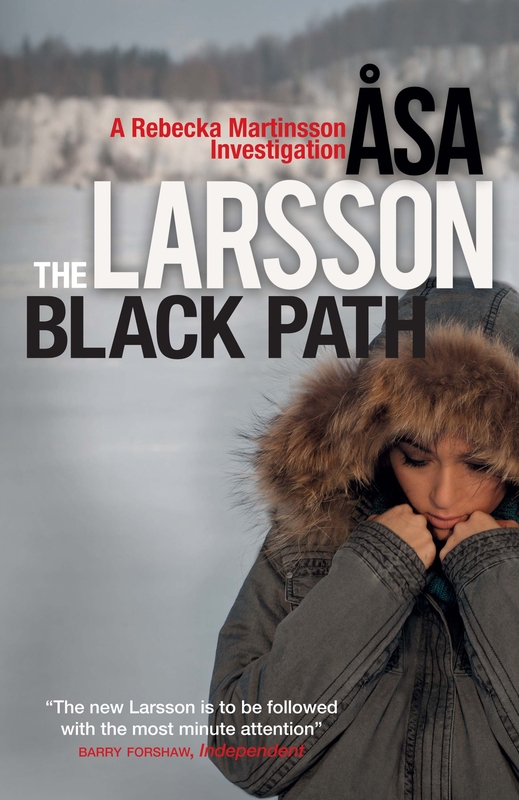 – and uber fraud investigator) and Mella (Anna-Maria, police inspector and harassed mother of four with a hapless Doolittle hubby), both of whom have featured in previous ‘Rebecka Martinsson investigation’ novels and so arrive in this one with fully-formed personal back-stories. Rebecka is a delicate soul, recovering from facial injuries and a psychotic episode that involved her wading naked into a frozen lake in a previous book (did I mention how cold it is oop north?). She’s called in by Mella to investigate the possibly shady dealings of ex-delinquent squillionnaire Mauri Kallis, who specializes in mining operations in unsafe and unsavoury parts of theThird World. The well-manicured corpse turns out to be that of charismatic and beautiful Inna, employed by Kallis to scout out lucrative investment capital for his overseas adventures. Inna’s brother Diddi (an old college mate of Kallis) is similarly employed, but both brother and sister appear to be careering unnervingly off piste: Diddi on drugs, and Inna – well, suffice it to say that an unspeakably rich old man is involved. These Swedish shenanigans are mixed in with some pretty pithy info about mining franchises in Africa, the financing of rebel armies, official corruption and money laundering – all of which is explored in such breezy and confident detail that you feel you’re getting a privileged insight into an especially stinky armpit of some especially malodorous regimes. Apart from the weight-lifting, jogging-blindfold, Sami-raised, precognition-gifted sister (a plot point crying out to happen), and the rather bland and meaningless title (why do crime novels have such unmemorable titles? ), this is a well-constructed, intriguing and informative read, beautifully translated by Marlaine Delargy. I’m off to gobble up the other three.